The Lounge is a modern, stylish bar, and is the perfect spot to enjoy a quiet & relaxing drink, a quick coffee or a light & tasty treat. The Lounge is also a prime location for a meeting with colleagues, drinks with friends or a quick bite to eat before a big match at the Aviva Stadium. Tea & Coffee Menu is available from 9.30am - 3pm where you can enjoy a sweet treat throughout the day. The Lounge Evening Menu has something for everyone with a delicious choice of traditional pub grub to a gourmet meal. The Lounge also offers an excellent selection of cocktails, wine, beer and other tipples; the perfect treat for those who want to unwind after a hard day at the office or a busy day sightseeing. 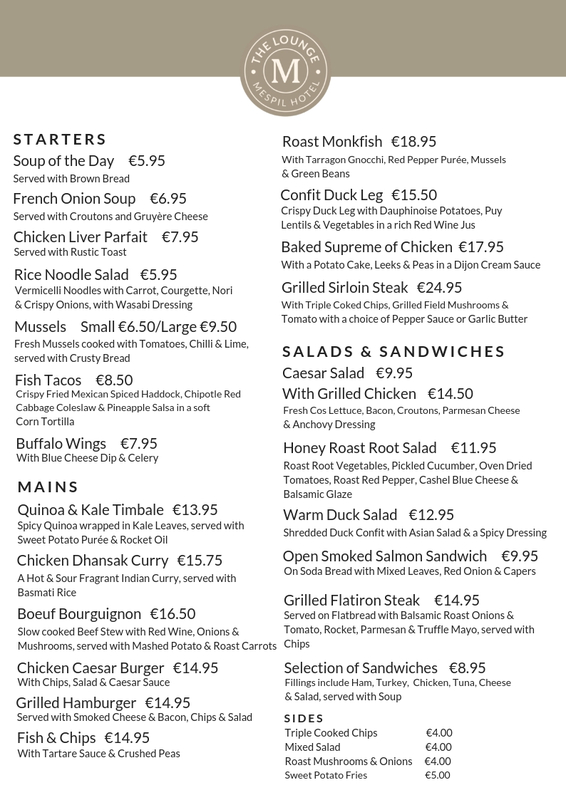 The Lounge Evening Menu is available daily from 3.00pm – 10.00pm.